The idea of a two ingredient pizza dough recipe has been floating around the internet for a while. This hit my inbox at some stage and while I noted it, I never really thought there was anything wrong with my existing pizza dough recipe. We had pizza a week or so ago and had some mozzarella hanging around in the fridge, so I was determined to use it up before it needed binning. Unfortunately, inspiration was a bit thin on the ground at the end of last week so … pizza it was. However, given that we always have yoghurt in the fridge I thought maybe it would be worth a bit of an experiment. I don’t know where the two ingredient dough originated but kidspot seems to stake an early claim. However, by both my standards and those of many of the commenters, the recipe given is really rather deficient. And that’s before I complain about the fact that the flour quantity is given in cups, rather than grams. I’m all for playing fast and loose with recipes but I suspect that had you never made pizza dough before you’d be facing an uphill battle with this one! The following recipe makes a thin crust for a 30cm diameter pizza tray. We find that this is perfect for dinner for the two of us (the small child won’t touch pizza on account of the bread component). Of course, the really important part of all of this is … how did it taste? While it was OK it was … just OK. While it was a thin and crispy base it had a slight but discernible taste of raw flour and the texture was slightly too crumbly (for want of a better word). The dough is also very soft which makes it difficult to work with. I can see the appeal in this dough – no yeast and no rising time. But with dried yeast so readily available and the rising time for pizza dough less crucial (and, indeed, for ease of dinner prep I made this dough in the afternoon so there was no advantage to me at all there) I’m not sure that the compromise in taste, texture and easily workable dough is worth it. We’ll be returning to our standard recipe. Yes, it’s 4 ingredients but so worth it! Preheat oven to 250°C fan (or as hot as it will go). Mix the flour and yoghurt until they come together in a soft dough. Knead well on well floured board and roll out to fit 30cm pizza pan (greased with olive oil). 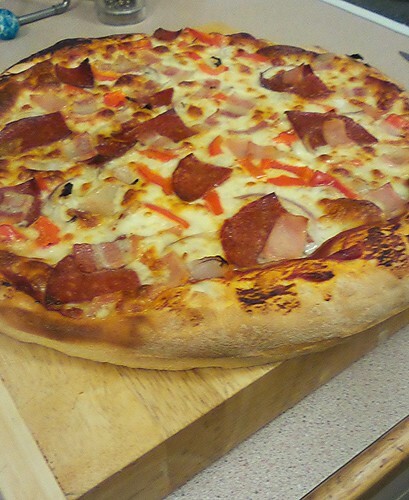 Top with your favourite toppings - we use a base of tomato paste, oregano and chilli flakes, topped with mozzarella, bacon, red onion, hot salami and capsicum (for example). It worked in the sense that it was a perfectly fine, serviceable pizza dough – we just much much prefer it when it’s made ‘properly’. If you were tossing up between a commercial pizza base and the two ingredient one, I’d go yoghurt & SR flour every time! Why is the top cooked well and the base cooks out soggy? Tried at 400 degrees, 450 degrees, used a pizza stone and tried with a baking pan. All the same. any suggestions? Hmmm, well we cook our pizzas at 250C fan (the hottest our oven goes). This is about 480F and, if using a non-fan oven, is actually about 520F. We make sure the oven is fully heated before putting the pizza in and we use a pizza tray with a perforated base. I also find that the choice/amount of toppings can affect how soggy the base turns out. In particular, I’ve found that using lots of capsicum/pepper seems to have a very detrimental affect. If I were you I’d try increasing my oven temperature (if you can), rolling the base a little thinner (again, if you can) and experimenting with toppings. Also it may be worth trying my other pizza dough recipe, as this recipe does produce a crisper end product.